From Ocean, to Gulf, to Bayou, and Swamps and Rivers, too… George Can Do, Can You? Snell Isle resident, Dr. George Stovall, can canoe. In fact, he is locally famous for his adventures, large and medium – no small ones. Key Largo to Bimini; from Fort Clinch on Fernandina Beach, up the St. Mary’s into the Okefenokee Swamp, into the Suwanee River, and down to Cedar Key; coastlines in Florida to Georgia to both Carolinas; George has done it, alone and with companions. He likes to paddle; he loves to experiment. He has kayaks, canoes, and stand-up paddleboards – but he loves his dugouts the most. His 50- to 100-year-old, Honduran dugout (cayuka) isn’t just hanging on display at George’s office or at his home on Coffee Pot Bayou. 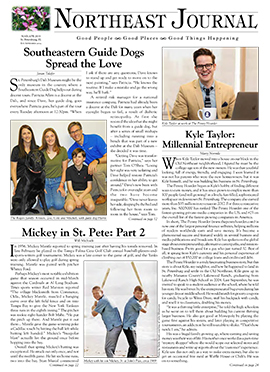 This dugout goes everywhere, but is stored on George’s dock when ‘resting.’ He has some buddies who accompany him – or he accompanies them – regularly on these adventures (probably his best-known buddy is Terry Tomalin, of the Tampa Bay Times). 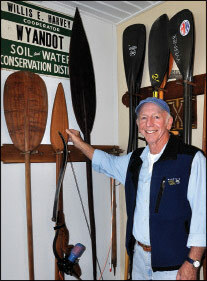 George and friends have paddled many miles over many years. “A number of years ago , four of us paddled my 24-foot dugout 100 miles down the Gulf Coast of Florida in three days in the first experiment of its capabilities,” George recalls. This adventure was enjoyed by St. Petersburg Times readers, published in three parts, thanks to author and fellow adventurer, Tomalin. Recently, George was approached with the possibility of lending his antique dugout canoe for a new adventure: paddling 130 miles to Cuba, Key Largo to Havana. 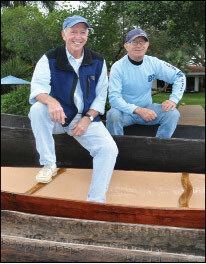 In fact, it was one of these paddling buddies – Aaron Freedman and his friend Jim Hartnett – who presented their idea to him. Although George had contemplated such a trip for years, the logistics were and are still daunting. 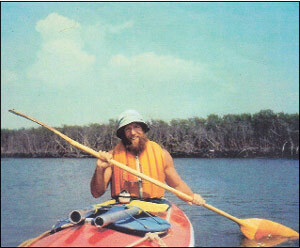 “I was quite interested when Jim and Aaron started thinking about paddling such a craft from Florida to Cuba, and I have offered my dugouts to the endeavor,” George says enthusiastically. George has quite the collection of dugouts now, including a smaller one that looks like an alligator, and an 11-foot Panamanian dugout. This larger one will be connected to the bigger dugout as an outrigger. George’s friend, Floyd Bonnell, a seasoned boat-builder and Old Northeast resident, will attach the two dugouts (Panamanian and Honduran), because adding an outrigger will make for more stability in the water. And, George’s crew will be able to paddle on more adventures in Florida! Aaron and Jim are the two ‘X-men’ who plan to paddle George’s boat to Cuba, perhaps within the next year or two. George calls them X-men in reference to their involvement in extreme races like the ones which consist of running, paddling, biking, and swimming across Florida… or 100-mile marathons in Colorado… or swimming across bodies of water in the Bahamas, etc. They probably have what is needed for a 130-mile paddling trip! They may also use George’s handcrafted sail for more speed. George crafted a mast from a neighbor’s bamboo plant, and contracted a sail maker to create an appropriate sail for a lateen rig. 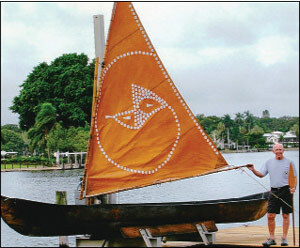 Being George, he wasn’t content with a plain sail, so he secured the talents of Phyllis Kolianos (then manager of Weedon Island Preserve’s Cultural and Natural History Center) to hand paint a design copied from an ancient piece of original Weedon Island pottery. This local punctated pottery (from the Tocobaga Indians) was known even then as the best in the southeast. Oh, and George shaped two paddles using quahog shells, just like the natives did! It has been surmised that native people did use sails and outriggers for speed and stability. According to George, there is no hard evidence of their doing this except for children’s toy canoes found in the Marco Island area which had sails and outriggers. But, now with the unfolding of relations between the two countries, it may be the perfect time to strike out for Cuba. It must be serendipity, for this would be the first time in recent history that anyone has tried to do this. And George would realize his long-time archeological dream of discovery: that ancient peoples did in fact traverse the waters between Florida and the Caribbean Islands. “Since the early ’70s, I have been a paddle sports enthusiast, owning kayaks, canoes, outriggers, stand up paddle boards, and finally, dugouts.” George is a Snell Isle native, and besides being a chiropractor, an artist, a past president and director of the Snell Isle Property Owners Association, and a recent director for the Alliance for Weedon Island Archeological Research and Education, he was once a free-spirited young man out west. Sometimes he lived in a painted school bus, but he was always working and was always an outdoorsman. He became enthralled with backpacking, climbing, and mountaineering when he began working for the North Face Company in Berkeley in the 1960s. He continued to make his living in the outdoor world and as a clothing artist until he graduated from chiropractic school. That included a stint at Bill Jackson’s outdoor sports store in Pinellas Park, along with paddling partner Darry Jackson. But, of course, over the years George also paddled. Now that retirement is upon him, he has volunteered to be the resident chiropractor at the St. Petersburg Free Clinic. It was back in 1973 when George struck out on his first major canoeing adventure. He paddled from Ft. De Soto to Key West – 350 miles to the south – and he did it solo. This was before he acquired the mahogany dugout. For this adventure he used a 16-foot kayak and hoped to paddle an average of about 30 miles per day for 12 days. Was he crazy? He asked himself that question the very first day (according to his 16-page trip journal) when the wind picked up and the waves were rolling out of the mouth of Tampa Bay. This journal makes for fascinating reading of George’s thoughts about the unique things he saw, the vagaries of weather, the people he met, and the land and sea creatures he encountered. There is a lot of advice about kayaking, too. Especially endearing are the poems and sketches he created to depict (and remember) his exploration. One sunset as he set up camp on a small island, he was given a free dolphin performance when those friendly ocean mammals did ‘tail walking,’ leaping, and ‘motor-boating’ all night long! (It really was all night long, since the mosquitoes were so furiously biting he couldn’t sleep.) He sketched two porpoises that “leaped free of the water” directly in front of his boat on another occasion. “To see such a sight brings good luck,” he wrote. White caps all around me, Oh Lord, please help me. I think I see the coming, Of an awful night. The sun went down so quickly, Oh Lord, send me the light! So, why do this? We don’t have ready access to the Russian and Cuban archeological studies done in Cuba, George explains. “We would like to foster and inspire that country to develop and find their archeological history,” so both countries can share the finds. Is it possible that the Indians paddled from here to there, Florida to Cuba? 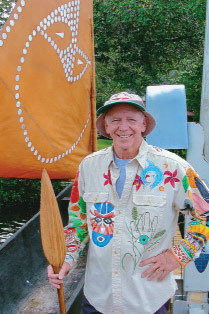 According to George’s research source, Dr. Robert J. Austin, Cultural Resources Consulting in Riverview, “The canoe uncovered at Weedon Island would have been used by people of the Safety Harbor culture. That culture began about AD 900 and lasted until about AD 1750. The Tocobaga were the historic descendants of the Safety Harbor people.” George notes, “We have no pictures, no artwork to use as reference.” So there is no absolute proof that the Florida people got to Cuba. Maybe such an expedition will solve that dilemma. 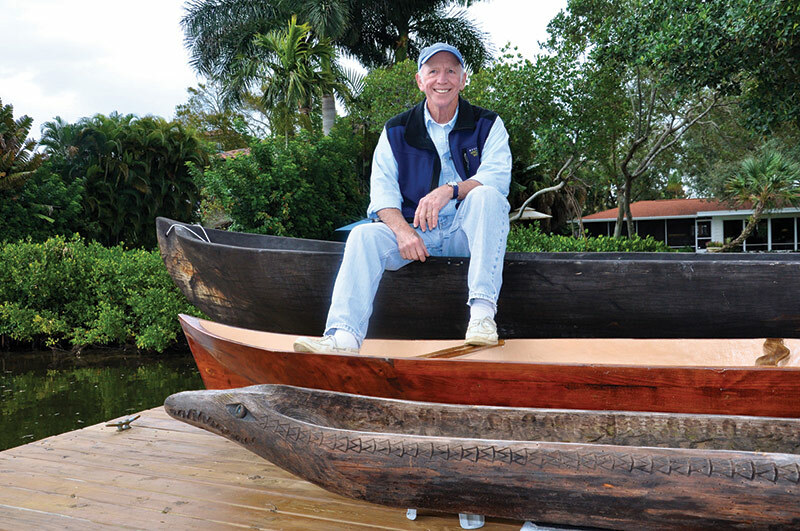 Of course, George was very involved in fundraising for the recovery, display, and lecture series about the 1100-year-old dugout at Weedon Island, as well as the actual digging out of the ancient canoe in 2011. He has also visited several other ancient dugout canoes throughout Florida. They are not well-maintained or accessible, either. One can only imagine what remains there are in Cuba! The ancient dugout canoe uncovered at Weedon Island is on display at the Cultural Center as well as a video of its recovery. The cultural center also provides lifelike visuals of creating a dugout canoe and the life of the Indians of that time. We can all share the light of discovery thanks to the efforts of George and the many others devoted to exploring and digging and paddling!